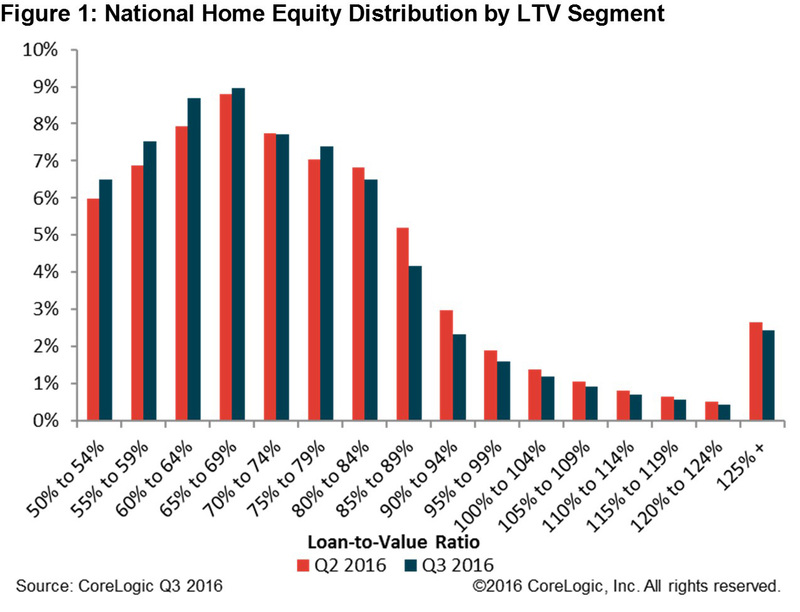 CoreLogic® (NYSE: CLGX), a leading global property information, analytics and data-enabled solutions provider, today released a new analysis showing that U.S. homeowners with mortgages (roughly 63 percent of all homeowners) saw their equity increase by a total of $227 billion in Q3 2016 compared with the previous quarter, an increase of 3.1 percent. 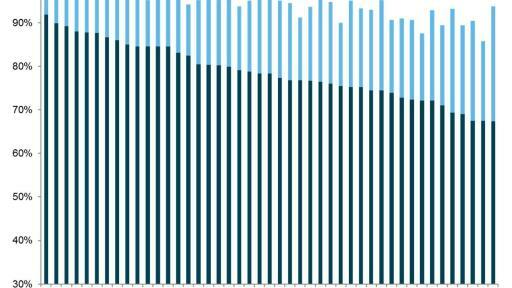 Additionally, 384,000 borrowers moved out of negative equity, increasing the percentage of homes with positive equity to 93.7 percent of all mortgaged properties, or approximately 47.9 million homes. Year over year, home equity grew by $726 billion, representing an increase of 10.8 percent in Q3 2016 compared with Q3 2015. In Q3 2016, the total number of mortgaged residential properties with negative equity stood at 3.2 million, or 6.3 percent of all homes with a mortgage. 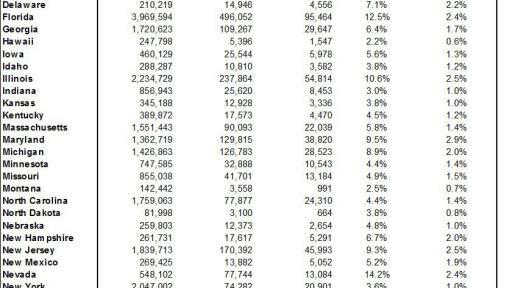 This is a decrease of 10.7 percent quarter over quarter from 3.6 million homes, or 7.1 percent of mortgaged properties, in Q2 2016 and a decrease of 24.1 percent year over year from 4.2 million homes, or 8.4 percent of mortgaged properties, in Q3 2015. 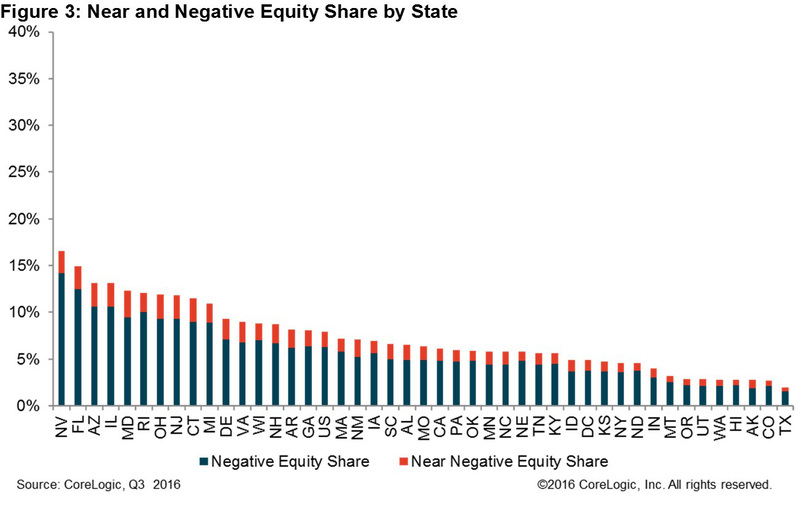 Negative equity peaked at 26 percent of mortgaged residential properties in Q4 2009, based on CoreLogic negative equity data, which goes back to Q3 2009. The national aggregate value of negative equity was about $282 billion at the end of Q3 2016, decreasing approximately $2.1 billion, or 0.8 percent, from $284 billion in Q2 2016, and decreasing year over year about $25 billion, or 8.2 percent, from nearly $307 billion in Q3 2015. 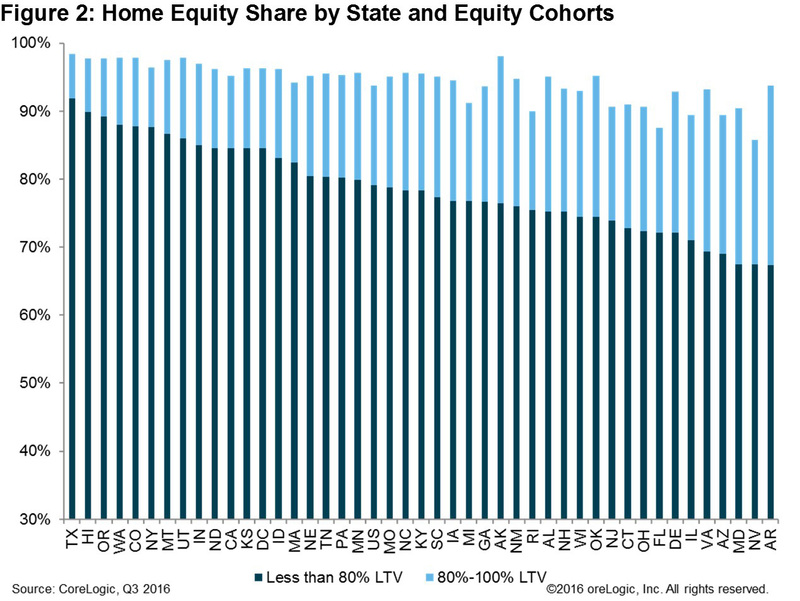 Texas had the highest percentage of homes with positive equity at 98.4 percent, followed by Alaska (98.1 percent), Colorado (97.9 percent), Utah (97.9 percent) and Washington (97.9 percent). 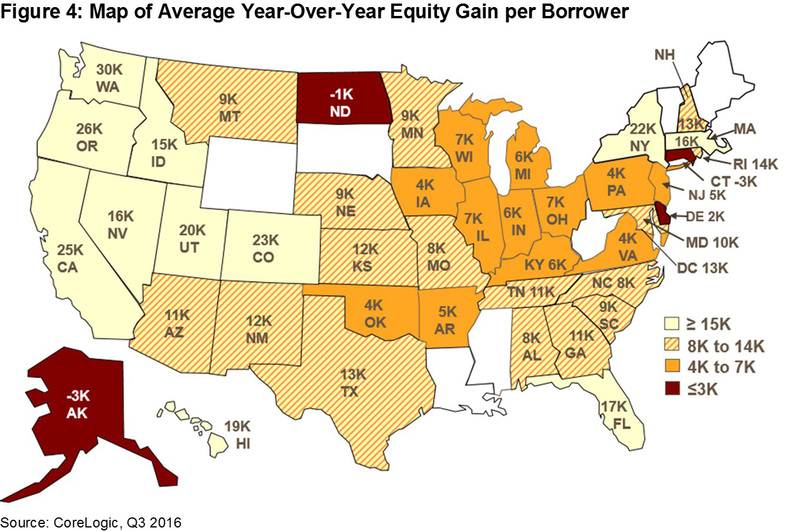 On average, homeowner equity increased about $13,000, from Q3 2015 to Q3 2016 (for mortgaged properties). 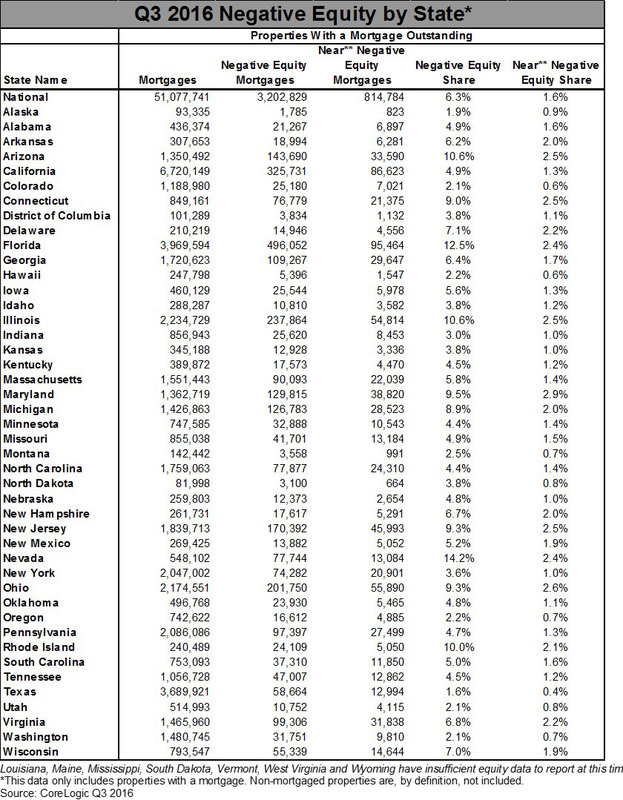 California, Oregon and Washington had increases of $25,000 to $30,000, while Alaska, Connecticut, and North Dakota experienced small declines. 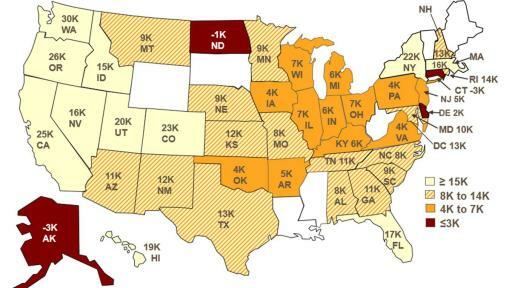 Nevada had the highest percentage of mortgaged properties in negative equity at 14.2 percent, followed by Florida (12.5 percent), Illinois (10.6 percent), Arizona (10.6 percent) and Rhode Island (10 percent). 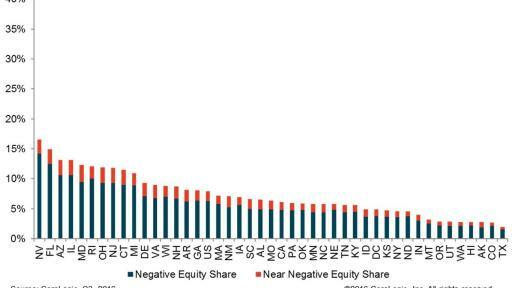 These top five states combined accounted for 30.6 percent of negative equity mortgages in the U.S., but only 16.3 percent of outstanding mortgages. 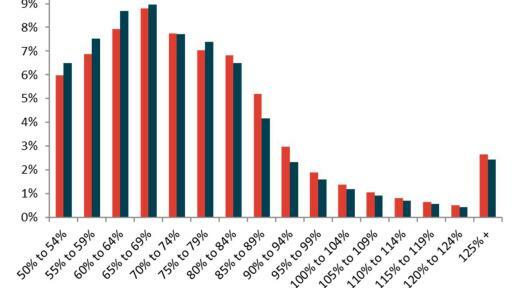 Of the 10 largest metropolitan areas by population, San Francisco-Redwood City-South San Francisco, CA had the highest percentage of mortgaged properties in a positive equity position at 99.4 percent, followed by Houston-The Woodlands-Sugar Land, TX (98.5 percent), Denver-Aurora-Lakewood, CO (98.4 percent), Los Angeles-Long Beach-Glendale, CA (96.9 percent) and Boston, MA (95.3 percent). Of the same 10 largest metropolitan areas, Miami-Miami Beach-Kendall, FL had the highest percentage of mortgaged properties in negative equity at 17 percent, followed by Las Vegas-Henderson-Paradise, NV (16.2 percent), Chicago-Naperville-Arlington Heights, IL (12.2 percent), Washington-Arlington-Alexandria, DC-VA-MD-WV (8.7 percent) and New York-Jersey City-White Plains, NY-NJ (5.1 percent). *Q2 2016 data was revised. Revisions with public records data are standard, and to ensure accuracy, CoreLogic incorporates the newly released public data to provide updated results.